If you’re a fan of The Lord of the Rings trilogy, you’re going to LOVE this new online slot machine. Available at all Microgaming online casinos (which, unfortunately, bar US players), you can win a massive 1.9 million — yes, MILLION — credits in the bonus round. ALL SLOTS CASINO today announced it will introduce the ?eagerly awaited five reel cinematic online slot game, The Lord of the Rings: The Fellowship of the Ring, to its online casino. 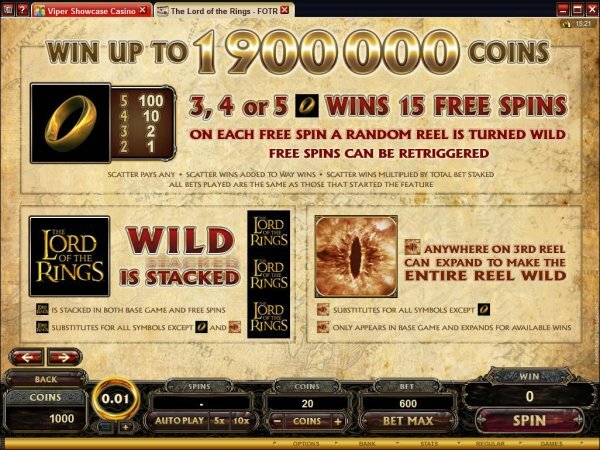 The game, which promises to be the biggest launch this year, offers players, a massive 243 ways to win, the famous The Lord of the Rings™ characters and will be one of the most graphically rich, innovative and exciting online slot games to date. The Lord of the Rings: The Fellowship of the Ring online slot will be available only to adults in countries where online gaming is permitted. The online slot game has been created by Microgaming, the world’s largest provider of online gaming software. The Lord of the RingsTM game will be powered by Cinematic Spins™ – a software program that allows movie clips to act as moving backgrounds behind the reels during spins. This offers players an unprecedented level of excitement and immersion. Win sequences and expanding wilds also make use of cinematic clips, instead of traditional animated graphics. Villa Fortuna Casino, along with eight other Microgaming sites that were promoted by Grand Prive Affiliates, have been blacklisted at The Online Casino Gambling Directory for breach of contract with its affiliates. Grand Prive Affiliates contracted with affiliates to have affiliates refer customers to various Microgaming sites (Bella Vegas, Fortune Junction, Jackpot Wheel, Jupiter Club, Lake Palace, Road House Reels, Casino Grand Bay, Grand Bay Poker). In exchange for referrals, affiliates were to be paid a percentage of the lifetime revenue generated by referred players (see bottom page at the above link). Weeks ago, Grand Prive Affiliates went out of business, while the sites that they were associated with, and to which affiliates referred players, remain operational. However, the sites are no longer paying affiliates for revenue generated by previously-referred players. This is theft and breach of contract. Villa Fortuna Casino, while not an original part of the eight Grand Prive-branded group of sites, is being run by the same outfit as that which operates the eight Grand Prive sites. The net-net of all of this is that, in my opinion, these sites are not to be trusted with your money. If they are willing to steal from and breach their contract with affiliates, there is sufficient evidence to think that they are perfectly capable of doing the same to its players. Trust me on this one… I’ve been in this business for years. Stay away from these nine sites. Besides, there are plenty of other top-rated, trustworthy Microgaming casinos and Microgaming poker rooms available to you. If you like poker freerolls, then you’re going to love this offer. From now through October 22, 2008, Cool Hand Online Poker is offering their players hourly freerolls! Each day, they are running 4 X $500, 4 X $200, 2 X $40 and 14 X $20 freerolls. This is a great opportunity to hone your poker skills and maybe even build a small bankroll to get started playing online poker. Novice and casual online poker players are catered to at Cool Hand Online Poker. Cool Hand Online Poker, unlike most poker rooms, limits players to 2 real money tables and 1 tournament table. This means that sharks have to work so much harder, for so much longer in order to try and take a player’s bankroll. In other words, it’s not worth their time, because to a shark time is money. The average poker player can now get in on all of the poker action without fear of their bankroll being ravaged. But that is not all that Cool Hand Online Poker is offering! All players can also take advantage of the $350 sign up offer that allows players to earn a $10 bonus for every 100 raked hands up to $350! That’s a massive payout rate that is 2.8 times faster than any of their biggest competitors!